Calgary, Alta. 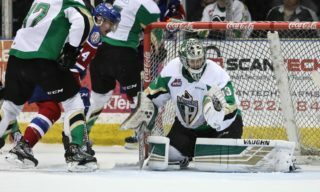 – The Western Hockey League announced today that Prince Albert Raiders goaltender Ian Scott has been named the WHL Vaughn Goaltender of the Month for November 2018. Scott, who was selected in the fourth round, 110th overall, by the Toronto Maple Leafs at the 2017 NHL Draft, posted an 8-0-0-0 record, 1.63 goals-against-average, stopped 223 of 236 shots for a 0.945 save percentage, and recorded two shutouts as the Raiders pushed their winning streak to 19 games, keeping them first in the WHL and in the Canadian Hockey League. November’s eight victories pushed Scott’s individual winning streak to 16 games and helped him earn WHL Eli Wilson Goaltending Goaltender of the Week honours for the second time this season. Two of Scott’s top highlights came during the month as he posted a career-high 43 saves in a 2-0 shutout against the Medicine Hat Tigers on Wednesday, November 14, followed by scoring his first-career WHL goal Friday, November 16 against the Tri-City Americans. 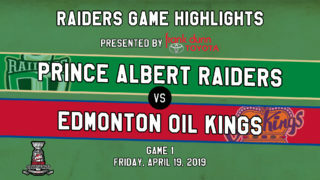 Scott’s goal was the first by a WHL goaltender since Edmonton Oilers prospect Stuart Skinner, who scored into an empty net against the Red Deer Rebels on March 18, 2016. Scott was twice named the first star of the game and earned a third star of the game honour as well. He was selected as the WHL’s first star of the night on two occasions. The 6-foot-3, 183-pound product of Calgary, Alta. currently leads all major goaltending categories in the WHL with 22 wins, a 1.61 GAA, 0.943 SV%, and four shutouts. 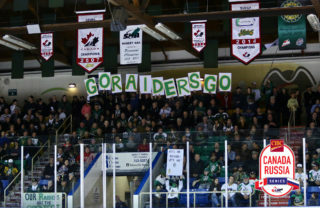 Selected ninth overall by the Raiders at the 2014 WHL Bantam Draft, Scott has appeared in 149 WHL regular season games with the Raiders, posting a 71-57-8-3 record, 3.06 GAA, 0.902 SV%, and seven shutouts. Scott’s goaltending resume includes a championship at the Alberta Cup, a gold medal at the 2015 World Under-17 Hockey Challenge, and a Calder Cup Championship in 2018 after joining the Toronto Marlies of the American Hockey League for the end of the regular season and their playoff run. Scott also picked up a 26-save victory with Team WHL to open the 2018 CIBC Canada Russia Series in Kamloops, B.C. on Monday, November 5, 2018. 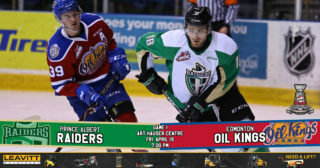 Monday, the 19-year-old was one of seven WHL players named to Canada’s National Junior Team Selection Camp roster in preparation for the 2019 IIHF World Junior Championship.